A few years back, Mayfair bought out Lookout Games – and I was honestly a bit worried; long time readers of the blog will know that I am a huge Lookout fan as their games are usually right in my wheelhouse. I was concerned that I would no longer have a source of meaty Euro-style games that I had grown to love. I’m happy to say that after these few years, all of my fears have proven wrong. This year, the two MayOut releases (or should it be LookFair) are Nusfjord and Riverboat, and thus far, they seem to keep to the usual standards that I have come to expect and love. 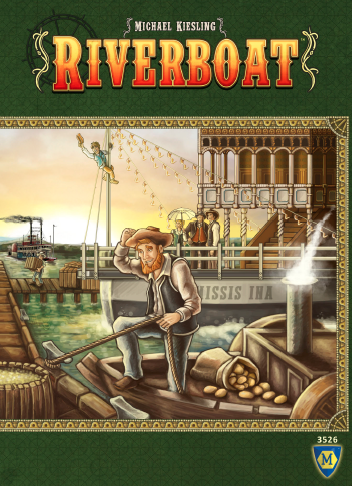 In Riverboat, players try to manage their farms which lie along the Mississippi to grow the best crops while they also try to get their workers down the river into New Orleans to build up your empire along the banks of the river. 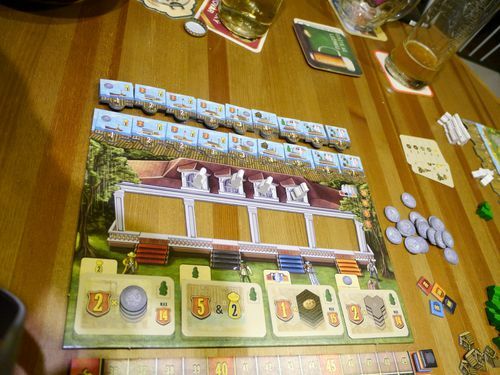 In the game, each player gets his own farm board – which look similar, but each has a different pattern of colored farm areas on it. The top of this board has notched areas for you to store your riverboats. Around the top of this board is a harbor master track. There are also a pair of central boards which will sit in the center of the table. 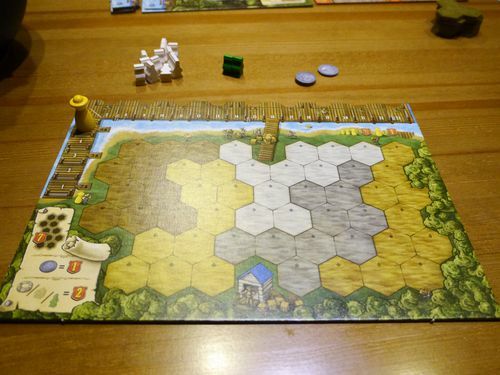 One has multiple spaces for the crop tiles and a scoreboard while the other has room for scoring cards, an area to collect workers and the harbor where the nine different types of riverboats dock. The game is played over four rounds, each having a setup period and then the same five phase process. In setup, the central board is prepared. Four opportunity cards are dealt to the appropriate area. Each of these has a scoring condition printed on it. At the top of the board, one of each of the nine types of riverboats is put into the notched dock. Finally all of the outlined crop tile spaces on the lower board are filled in with appropriate sized tiles. There are also five phase starter tiles – the current start player for the round takes these tiles, chooses one and then passes it to the left who now chooses one. This continues clockwise around the board until all tiles are taken (some players will have multiple tiles). Then the game round can begin; in each of the five phases, the player who holds the corresponding phase start tile will take the first action in that phase (as well as get a small special ability/effect). 1] Cultivation – The starting player for the phase first gets to place a worker on any free farm hex – this is taken from the central board. In this phase, players will place workers onto the fields. The start player draws 8 Cultivation cards from the deck. Then, one at a time, he reveals the top card from this stack and all players must place one of their workers on a hex of matching color. If the card is wild colored, all players are free to choose where they would like to place their worker. Additionally, for the cost of one coin, a player can choose to ignore the color specified on the card and place their worker on any free space. Once all players have placed, the next card is flipped up and the process is repeated. If you have no empty hexes of the specified color, you may place your worker on any empty space. Continue until all 8 cards have been revealed. If you have available workers, you must place them – though it might be possible near the end of the game for you to run out of workers midway through this phase. If this happens, simple place a worker with each card until you have none left in your supply. 2] Planting Phase – The start player of the phase first takes a coin. 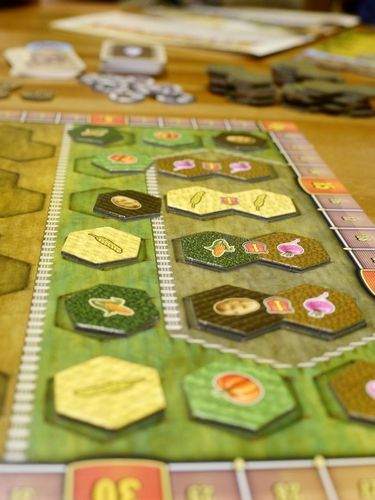 Then all players take turns to select a crop tile from the central board and place it on his personal mat. The chosen tile must fit underneath workers placed in the previous phase. Replace the workers on top of this tile. If you place a 2-hex tile score 1 point immediately, if you place a 3-hex tile, score 2 points immediately. In this phase, you can choose to pay a coin to place one of the 1-hex or 2-hex tiles from the supply as opposed to one displayed on the central board. This continues until all players have placed a crop tile underneath EVERY worker on their board. The supply of crop tiles is NOT replenished in this phase after each draw. 3] Harvesting and Shipping Phase – First, the start player moves their Harbor Master figure one space forward on their personal track. Then, players take turns claiming Riverboats from the central New Orleans board (remember, one of each of the nine types should be available each round). In order to claim a boat, you must remove the exact number of workers from your farm board (ALL from a single crop type) that matches the number on the chosen Riverboat. You take the boat tile and place it in the leftmost free spot on your personal board’s harbor. Each boat comes with some immediate benefits which are pictured on the top of the tile – such as VPs, moving your harbor master, getting an estate feature, or possibly moving a working into New Orleans. Additionally, the number at the bottom tells you the maximum number of points that this boat could score at the end of the game. In this phase, you can choose to spend a coin in order to take a boat from a supply stack. You might get the benefit of an Estate Feature: a Barn, a Well or a Surveyor token. Barns are placed on your farm board. When they are scored, they will score for all of one type of crop surrounding it. Wells are placed on the board as well, when they are scored, they will score for the contiguous group of hexes connected to the hex the well is sitting on. Surveyors are placed in your personal supply and will be used later to trigger the scoring. Finally, as you are harvesting your crops, be sure to count how many you have scored – when you harvest the ninth hex of a particular crop, you get to take an estate feature of your choice at that time. You could conceivably get this bonus five times; one for each type of crop. In this phase, players will have the opportunity to claim up to two Riverboats. In the fourth and final round, this limit is increased to 3 Riverboats. 4] Opportunity Phase – The start player for the phase first scores a victory point. Then each player in order chooses one of the face up Opportunity cards. 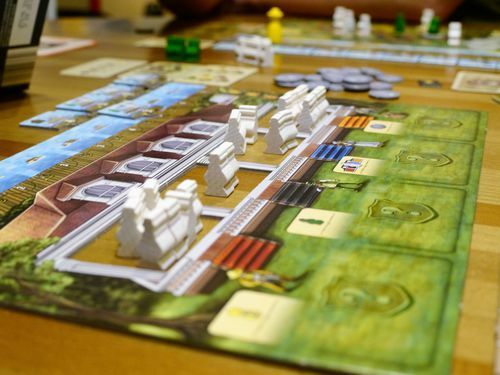 There are four slots on the board, and each is associated with a small bonus (move Harbor Master by 2, gain a Surveyor, move a worker into New Orleans or gain a coin). When you take your card, you immediately get that small bonus. The Opportunity card goes face up near your player board. It may be scored in a later phase. Each of these cards has a different scoring condition on it – most of them max out at 14 or 15 VP. If you choose to spend a coin in this phase, you take any Opportunity card from the face down draw pile as opposed to one of the face up cards. 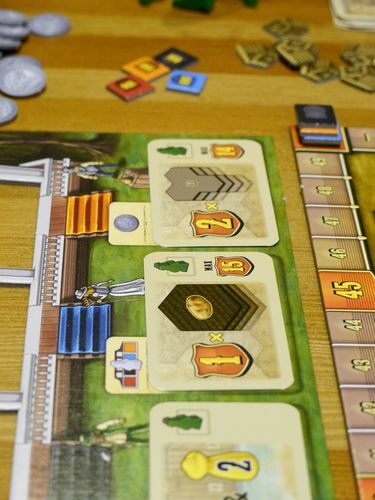 5] Scoring Phase – The start player first chooses between 1 coin, 1 Harbor Master step or moving one worker to New Orleans. Then, players have the opportunity to place up to 2 Surveyors (up to 3 in the final round). Surveyors can be used to score Barns, Wells or Opportunity cards – each of these objects can only be scored once per game. Wells score 1VP for each hex in a contiguous group of same colored crop hexes including the one the well is on. Opportunity Cards score based on the rules printed on the cards. In general, the max here is 14 or 15 VPs. Finally, at the end of the phase, each player scores 1VP for each Surveyor which has been placed as well as 1VP for each worker that you have in New Orleans. After the end of the scoring phase, go back to the Setup procedure to ready the board for the next round. Riverboat was a nice find for me. It was one of those games that didn’t make it to the table until January (with 80+ Essen games, you can’t play them all immediately! ), and I’m a bit sad that it took this long to play. It feels old-school in the sense that there aren’t any novel mechanisms within, but all the pieces fit well together to give a great gaming experience. Like many of the games from SPIEL 2017, this box is filled to the brim with boards, cards and bits. The game flows through the five phases easily, and each round offers a different piece of the overall challenge. I like the way that the start player for each phase is decided with the phase cards, and it adds a bit of strategy to the start of each of the four rounds in the game when you try to decide which round you’d like to have an advantage in. Though we missed it in our first game, the iconography on those phase cards also serves as a perfect player aid for the table to remind you what goes on in each phase! In order to do well in the game, you have to figure out how to cultivate in the right hexes and then next get the correct crops in the right places. It can be trickier than it looks – and you only have one chance to place a crop tile on your farming board space! Because of this pressure, you will often need to consider spending your money to take an exception on either the type of terrain to cultivate or to increase your choice in tile selection. You need to do this part well in order to give yourself the opportunity to get the right riverboats as well as the Estate Features – and to get the powerful Surveyors. You really don’t get many chances to score your Surveyors (2 per rounds 1-3, and 3 in round 4), so you’ll have to pick and choose your times to score. Sometimes you may need to score an Opportunity card or Estate Feature earlier than you want (and less efficiently than you want) because you can’t score them all in the final round. While all this is going on, you can’t forget about the Harbor Master and New Orleans! Losing half the value of your scoreable boats can be a big penalty when it comes to Harbor scoring – though it does take a fair amount of effort to win the Harbor Master race. Even if you’re not planning on being the furthest Harbor Master, you still have to pay some attention to this track as you will only score for the boats to the left of the Harbor Master at the end of the game (and generally, your most valuable boats will be closer to the right of your row as it takes time to build up resources to get those high valued boats). You will be placing workers in New Orleans all throughout the game, and the 20VP bonus for first place is a big component of your final score. If you go for this too early in the game though, you could find yourself short of workers to cultivate and harvest on your farm board. The only way to add more workers to your supply is to get the bonus for starting the first phase, so you really have to watch the numbers of workers that you have. As you can see, there is a lot to balance in the game, and that is what attracts me to the gameplay here. Rarely is it obvious what my “best” play will be for a round. Luck may need to be on your side in the drawing of terrain cards. It’s hard to fully predict the order in which crop tiles are drafted – so you may also need to be fortunate there. As a result, you are constantly assessing your situation as well as your opponents’ to try to figure out what you can do at any particular juncture in the game. This keeps the players very engaged in the game as each decision made by each player tends to impact the decision making process. Thus far, I have seen a number of different strategies succeed – and the weighting of the points ends up giving multiple routes to victory in each game. As I mentioned above, getting the full value of your boat points can be a huge score as can winning the New Orleans competition. The Opportunity cards can net you up to 15 points each, and some of them are more synergistic than others. However, given the limited number of rounds in the game, it is going to be hard to succeed at all of these things. You will have to likely focus on one of the main scoring areas and then hope to do the best you can in the others. Being flexible with what’s available to you (or spending your coins to improve your lot) is key to doing well in the scoring. After three games, I am still trying to figure out if there is a best way to approach the game, and I look forward to playing it more. It is still unclear to me whether or not this game will become a keeper, but it’s already made it past the first hurdle – keeping me interested past the first few plays! My only complaint is that, while as Dale notes there are helpful reminders on the phase tiles, individual player aids would also have been useful. Hardly anyone I have played with has remembered the bonus for harvesting nine tiles of a type on their own, for example; it’s on the phase III tile but players just don’t look at that. Doug G. (4 plays): This one’s a favorite from the Essen 2017 crop for Shelley and me. In fact, Kiesling’s three Essen 2017 designs/co-designs are all stellar products of different weights that we have enjoyed 2-player. Riverboat scales well, though may be a bit long at its full complement of 4. One of our current ways to judge what we think of a game is if we want to leave it set up to play a couple times more; that was certainly the case with this one. Joe Huber (1 play): This was a perfectly acceptable game which, just two months after I played it, I have nothing in particular to say about it. It neither fell into the traps I was worried it might, nor rose to the heights I hoped it would. Perfectly fine – but also forgettable. Larry (1 play): Despite this having an abstract feel, I enjoyed it quite a bit. There’s lots of different mini-games contained within it, but it all flows smoothly and doesn’t really feel like anything else I’ve played. Spending your coins wisely is important and there’s a lot of different ways to score. Right now, I rank this as one of the better games to come out of Essen this year. Neutral. James Nathan, Joe H.